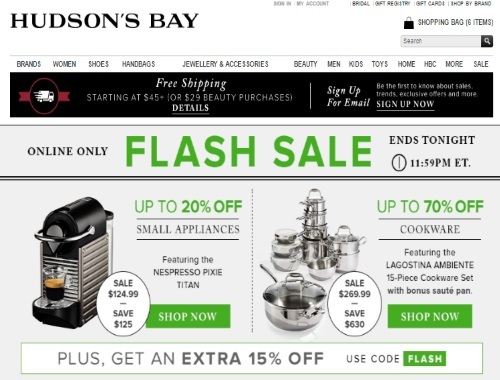 Hudson's Bay has a lot of Flash Sales today! Save up to 20% off small appliances featuring the Nespresso Pixie Tital on sale for $124.99 (Save $125). Save up to 70% off cookware featuring the Lagostina Ambiene 15-piece cookware set with bonus saute pan on sale for $269.99 (Save $630). Offer is valid today only, Wednesday, February 15, 2017.